The 2013 edition of the Astro A40 headset is an audiophile’s dream and will serve you well no matter what your gaming preference may be. Astro doesn’t want you checking out other headsets, whether you happen to be sitting at your desk, gaming on the couch, or walking down the street listening to music. The A40 comes with every cable you’ll need to connect to an Xbox 360, PS3, PC, or MP3 player (it will also support PS4 and Xbox One in a future firmware release). You’ll be drowning in options (and cables). You can change the magnetic 'stereo tags' to customize your headset. The headset itself has a white or black plastic exterior and cloth ear cups—attributes normally associated with cheaper products—but the flexible design and firm, soft grip make it feel anything but low-end. The A40 sports a flexible, detachable omnidirectional microphone that you can mount on either side, thanks to the swappable magnetic plates called “stereo tags” that customize the look of your headset. In other respects, though, the headset looks pretty plain. A single switch along the wire acts as a microphone muter, and you can fine-tune the adjustable headband for maximum comfort. The included mixer/amplifier is the real star of the show. The real star: The MixAmp Pro. The USB-powered MixAmp Pro is the hub for all your audio options. It comes with eight ports along the front and back for connecting consoles, PCs, and MP3 players. A Stream port consolidates all the inputs into one line for easy game streaming. The front has space for daisy-chaining several MixAmp Pros together for optimal audio at a LAN party or competitive event. 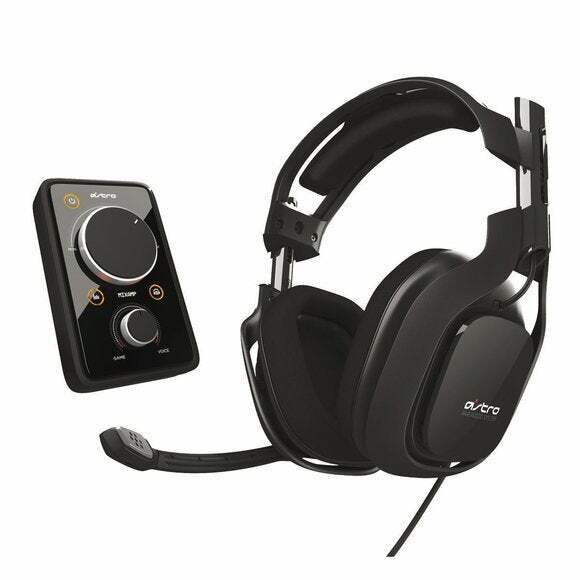 Astro took the extra steps needed to make the hardware appeal to the audiophiles, competitive gamers, and entertainers of the world. Besides being the cable hub, the MixAmp Pro lets you activate Dolby 7.1 surround sound with the touch of a button. Its four equalizing options emphasize gaming, core sound, media, and sports. It also includes an extra-large volume knob, and a mixer for adjusting how much game and voice sound you hear. It’s a great way to hear your squad over a flurry of bullets and be an effective teammate. The MixAmp Pro becomes a cable hub. Sound quality is fantastic whether you're listening to games, video, or music. The surround sound is immersive, and the bass resembles what you'd hear when sitting in a theatre. This headset can be complicated to set up—it’s not a plug-and-play affair—so impatient gamers may want to steer clear. But that complaint aside, the A40 is the ultimate headset. It satisfies every audio need and is worth every penny of its $250 price tag. The Astro A40s are the all-encompassing headset for every console, PC, and MP3 player and provides an unprecedented sound experience when paired with the MixAmp Pro.